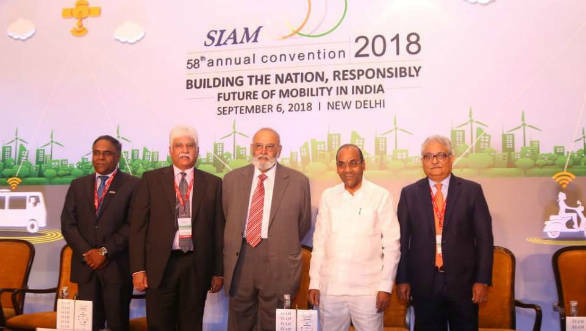 At the 58th Annual Convention held today by the Society of Indian Automobile Manufacturers (SIAM), dignitaries from the auto industry highlighted the need for a long-term regulatory and policy roadmap for India's auto sector and moderating GST taxation. This, while keeping in mind the global transition to electric vehicle and future mobility. Dr. Abhay Firodia, president, SIAM & chairman, Force Motors, urged the government to address the need for a long term regulatory policy roadmap for India's auto sector and also moderate GST taxation. He, however, stated that the implementation of GST has made taxation regime far more streamlined. He also said policies changed in an ad-hoc manner, creates uncertainty in the industry and called for a 10-year policy roadmap of the sector which will give more sustainability and growth to the sector as vehicles are no more a luxury good and are important for driving the economy. He requested the government to help bring down multiplicity of organisation with which the sector has to deal with. He said incompatible and contradictory regulatory environment could shy away investments from the country. He said that in just four years of moving from BS IV to BS VI, emissions is very fast and given the fact that the industry today is far more complex, there is a need to build an ecosystem and the transition needs to be gradual as opposed to having a sudden disruption. 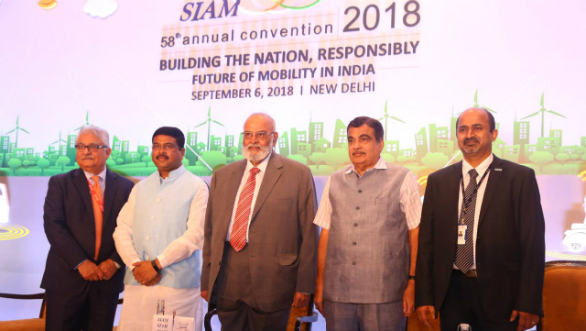 Nitin Gadkari, minister of road transport, Highways & Shipping and Water Resource, River Development, and Ganga Rejuvenation, who was the Guest of Honour, announced exemption of commercial vehicles, buses, taxis and all vehicles running on alternative fuel from the permit requirements. This, he said will open more businesses for the industry. He also informed that any two-wheeler can be run as a taxi in non-metro cities and this will provide large employment opportunities for young people. He also called upon the industry to look at diversification and new economically viable businesses. "You can explore water transport, which will not only be economical but also provide open growth for the auto sector. We are adding more roads, highways and the industry is benefitting from it. The government is ensuring seamless and faster traffic which will connect people and goods faster. More access to fast track and electronic toll plaza is being given. We are also cancelling speed governors. We don't need it as we are developing good roads. There is no need to limit the speed artificially," said Gadkari. He said the industry must ensure better models, engines and produce high-performance vehicles. "Our government has given priority for development of bio-fuel. Our price-centric mentality needs to be cost and comfort-centric," he added.